Prakash will introduce the cuisine of the region, including the spices used and typical ingredients such as chilli, coconut, curry leaves and tamarind. With his guidance you will prepare all of the recipes and then sit to enjoy your Southern Indian feast. Prakash grew up in Sri Lanka, just a few miles across the sea from South India, and vividly remembers the flavours of his mother’s cooking. About the local cuisine he writes, “Each and every meal satisfies all the taste buds without fail, being pungent, sweet, sour, bitter, astringent and salty. You cannot ask for more!” He is also a huge fan of Malaysian and Thai food. When he arrived in the UK as a young man, Prakash worked as an accountant and survived off fish & chips and British pies, both of which he still loves. Here in London, away from family, he had to learn to cook. This necessity became a hobby, and the hobby became his passion. Prakash left accountancy to set up a catering business. 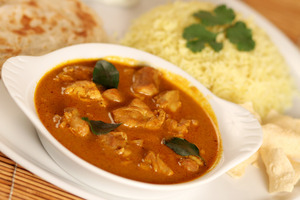 An award winning Sri Lankan and South Indian restaurant in Hampstead followed. After eight years of running the restaurant, Prakash is now sharing his passion for southern Asian cuisines in kitchens across London and beyond. Price: £90. 10% discount if you bring a friend, so £162 for two.